The largest cost component of an industrial air compressor over its lifetime is the energy required to run it—far surpassing the initial investment and maintenance costs. Producing compressed air can account for 20-40% of a plant’s total energy bill. That means that as plants look for ways to save energy costs and maximize efficiency, air compressors should be at the top of the list. Regular maintenance and reducing compressed air leaks are important, but the story begins with the compressor itself. The right Gardner Denver variable speed compressor for the right application delivers significant energy savings and a consistent air supply. These compressors are designed to more efficiently handle the fluctuating air demand found in most plant air systems. Industrial air compressors can be classified as either fixed or variable speed. 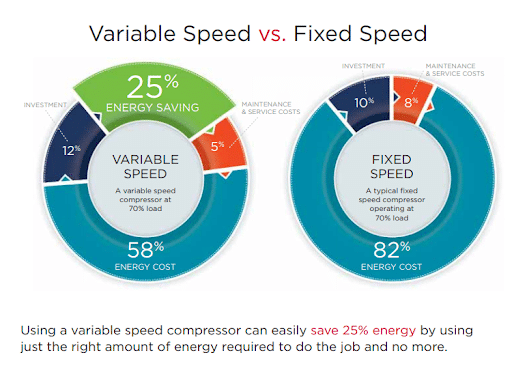 First let’s take a look at fixed vs variable speed compressors in terms of energy savings. With a fixed speed compressor (also called an “idling compressor” or “load/unload compressor”), the motor runs constantly at a fixed RPM. If air is needed during the plant time, the inlet valve opens a bit. If not, the inlet valve closes. The motor doesn’t ramp up and down to match demand. It’s either at full throttle or off. That works well if your application requires a full load compressed air supply. Most applications don’t; they have a fluctuating demand. The unneeded energy is wasted. That’s where variable speed compressors can provide significant energy savings. Variable speed compressors utilize variable speed drive (VSD) technology that allows the motor to ramp up and down to match demand. The most common type of VSD technology used in air compressors is the variable frequency drive (VFD), which varies the frequency and voltage supplied to the motor. A 100-horsepower variable speed compressor can go down to the equivalent of a 20-horsepower compressor when demand is low, saving energy in the long run. Using a variable speed compressor can easily save 25% on energy costs by using just the right amount of energy to meet demand and no more. Depending on the application, energy savings can be as high as 50%. Gardner Denver has been at the forefront of compressed air technology for decades, and offers some of the most energy efficient and low environmental impact compressors available on the market today. With one of the industry’s widest product ranges, they offer multiple air compressor lines that utilize variable speed drives. LRS Series single stage compressors provide world-class energy efficiency through the use of a robust inverter drive system, which precisely matches power consumption with air demand. The clean and simple machine layouts reducing piping, which cuts down on the opportunity for energy-wasting leaks. Designed for variable air demand, VS Series compressors utilize a motor/drive/airend combination that ensures industry leading turndown capability and optimum energy efficiency. These compressors match the supply of compressed air, at the specified target pressure, to your system’s specific demand while minimizing the power required to compress the air. Air flows with the least possible restriction, maximizing efficiency. 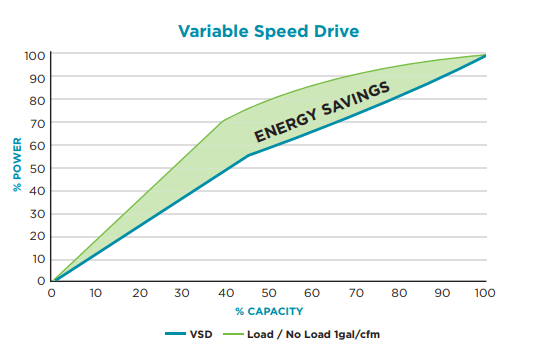 The VS Series delivers tremendous power savings at part load points. At no load, VS compressors stop running and do not vent to atmosphere, eliminating any waste of compressed air in the reservoir. Gardner Denver VST air compressors offer all the benefits of the VS Series in a two-stage model—employing 8-12% more efficiency than single stage models. VST compressors come packaged with two motors and two air-ends for optimum performance. The technology employed in the airend rotor profiles synchronizes the speeds and performance of the first and second stage airends, to optimize the performance and energy efficiency. EnviroAire TVS compressors efficiently and reliably handle varying air demand with a matched motor, direct drive and air-end. These oil-free compressors deliver no oil into the air stream and minimize microbial content through high-temperature compression to reduce product contamination risk. EnviroAire VS Series two-stage compressors contain absolutely no oil anywhere in the compressor and have been certified ISO 8573-1 Class Zero (2010) and silicone free. They provide a clean, reliable and efficient air supply with no risk of oil contamination. Is a Variable Speed Air Compressor Right for My Application? When correctly sized and implemented for the proper application, variable speed compressors have the potential to deliver significant energy savings. They also have a considerably higher upfront cost. 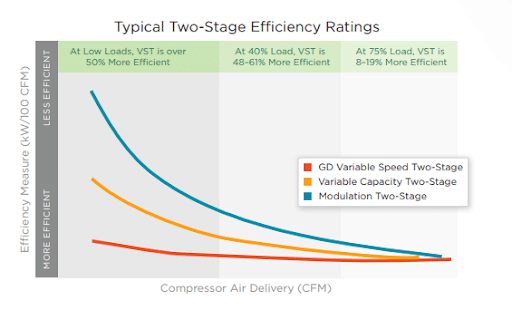 Plants with fluctuating air demand—whether from seasonal production changes or differing levels of air demand across shifts—can often justify the higher cost of variable speed over single speed compressors due to the sustained energy savings. Plants may also qualify for energy incentives and credits for implementing energy-saving technologies. There are other considerations. Variable speed compressors are sensitive to power inconsistencies. If there are any concerns in this area, data logging should be done to ensure power consistency before deciding on a compressor. The sensitivity of VSD drives also makes them susceptible to dirty and wet conditions, requiring extra protection. A professional compressed air audit is the best way to determine if a variable speed compressor is appropriate for your application and will deliver your target cost savings. C&B Equipment is proud to be a Licensed Distributor of Gardner Denver air compressors. The efficient and reliable performance of these compressors helps you increase your uptime—the mission that guides everything we do. Contact us today for assistance selecting the right compressed air solution for your application. We also offer air audits to identify energy cost savings.